Dr. Grant Loosvelt's goal is to provide the highest quality care, the best possible results, and a pleasant overall experience to every patient he treats. He offers sedation dentistry to help put his patients at ease and always uses the most technologically advanced equipment available. Patients who wish to entrust their oral health to a single capable dentist rather than being referred from specialist to specialist can turn to Dr. Loosvelt for all major dental procedures. In addition to the placement of porcelain dental veneers and Zoom!® tooth whitening, he also offers BOTOX® Therapeutic dentistry for TMJ treatment and dental bonding for patients in Beverly Hills, Los Angeles, and beyond. Many people suffer symptoms such as shoulder and neck pain, headaches, and ringing in the ears, which may be caused by problems with the temporomandibular joint (TMJ). If left untreated, the grinding and clenching that are associated with temporomandibular disorder (TMD) may cause damage to the teeth, jaw joints, and gums. Fortunately, we offer TMJ treatment with BOTOX® injections at our cosmetic dentistry practice serving Beverly Hills and Los Angeles, which can ease the symptoms associated with TMD. BOTOX® Therapeutic dentistry is a popular treatment that is used to immobilize the facial muscles that cause wrinkles. It is also effective for relaxing muscles in the jaw that cause some of the most common symptoms of TMD, including clenching and grinding of the teeth. Dr. Loosvelt administers a few quick BOTOX® injections into the targeted area to relax the jaw muscles and ease these symptoms for several weeks. If you are experiencing migraine headaches, pain in the neck, shoulder, or jaw, popping or clicking when moving your jaw, or ringing in the ears, you may be suffering from TMD. If you are interested in learning more about BOTOX® Therapeutic dentistry and TMJ treatment, contact our Beverly Hills and Los Angeles area practice to schedule a consultation with Dr. Loosvelt today. Teeth that are chipped, cracked, or separated by gaps can significantly detract from your smile and overall appearance. We can conceal these and other imperfections with dental bonding. At our Los Angeles area practice, we often suggest dental bonding to patients who want a conservative yet effective way to restore the health and beauty of their teeth. As with porcelain veneers, dental bonding is used to cover aesthetic flaws in teeth. However, the bonding procedure can be completed in a single office visit rather than the several visits required by veneers. We start by etching the surface of the tooth to be treated with dental bonding. We then apply the bonding material and sculpt it into the desired shape. The bonding material is matched to the color of surrounding natural teeth, so that the treated teeth will blend in perfectly. Once the material is shaped, it is hardened using a special light and then smoothed and polished for a natural-looking appearance. If you have teeth in need of repair, consider dental bonding at our Los Angeles area practice. We can treat one or several teeth with bonding, with results that can last for years with proper care. Contact Century City Aesthetic Dentistry to schedule a consultation with Dr. Loosvelt and find out whether dental bonding is the right cosmetic treatment for you. Often, our tooth whitening patients who have old metal fillings find that bleaching, alone, is not enough to help them achieve the dental makeover they desire. 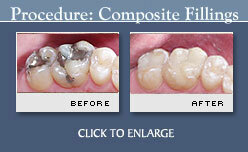 If conspicuous metal fillings are preventing you from having the smile you want, composite fillings may be the answer. In the past, metal cavity fillings were standard, but now they can be a thing of the past! Dr. Loosvelt uses tooth-colored composite fillings to restore strength and health to the teeth while maintaining their natural appearance. If you have a cavity that needs to be filled, or if you would like to have your metal fillings replaced, composite fillings are a great alternative. Because they contain no mercury, they are a safe way to repair damaged teeth, and their natural color makes them an ideal aesthetic choice. In addition, the composite material is strong and long lasting. To learn more about Tooth-colored Fillings, dental bonding, TMJ treatment, or BOTOX® Therapeutic dentistry at our Los Angeles and Beverly Hills area practice, contact Century City Aesthetic Dentistry today. To learn more about dental bonding and TMJ treatment with BOTOX® Cosmetic, contact our dentistry practice in the Beverly Hills and Los Angeles area today. Using porcelain veneers, these patients were provided with an esthetically pleasing smile in a relatively short time. Dental bonding, TMJ treatment, and BOTOX® Therapeutic dentistry are available to Los Angeles and Beverly Hills area residents at our practice. At Century City Aesthetic Dentistry, we offer a range of options to help our patients achieve outstanding smiles.